Here is another wonderful rubric for evaluating multimedia projects in your classroom. This rubric which I came across through North Carolina State University website is realized by Multimedia Mania. As a teacher, you can use this document in your instruction to assess your students’ digital projects. 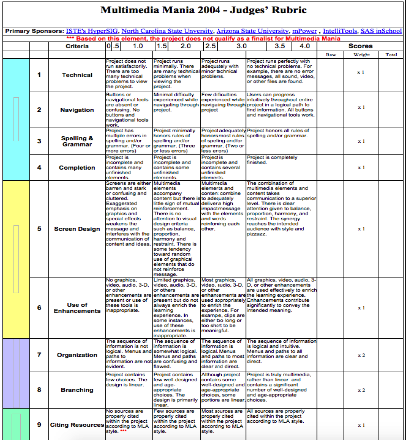 The rubric uses a wide variety of criteria grouped under different colour codes. From the technical design of the project to citing resources, the rubric covers almost every aspect you will want your students to attend to while doing their multimedia projects. This document is also available for free download from this link.